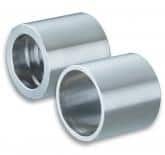 Our stainless steel radial crimp style couplings provide a 360 degree external crimp. Radial crimping does not deform the interior of the smooth stainless steel fitting, maintaining the purity, and integrity of the coupling. Rubber Fab’s barb design allows full flow of product, this radial crimp system is C.I.P. suitable, and does not require disassembly for cleaning like externally clamped fittings. In addition, radial crimp fittings have a smooth external surface, with no bands or wires to hinder dragging or injure workers.